Almeria Spain Reviews and Travel Insider Tips written by You! The Unique Almeria Readers would love to hear from You! Do You Have Some Almeria Travel Tips? Great Photos or Travel Stories to Share? There are more than 20.000 monthly visits to this site in search of great Insider tips, so: Please DO tell! You can now directly write your article about Almeria online! I shall be pleased to publish it. Did you follow the footprints of your famous actor? Ventured into the Tabernas Desert? 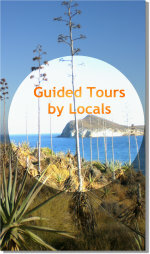 Do you have any travel tips for Cabo de Gata Naturalpark? Towns & Villages? Which was your favourite hiking experience? Discovered an amazing spot in Almeria Province you'd like to share ? Thank you for sharing your Almeria experience with us! Start writing your own Almeria article here and get it published on this site!